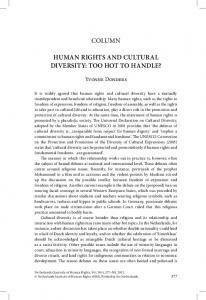 COLUMN HUMAN RIGHTS AND CULTURAL DIVERSITY: TOO HOT TO HANDLE? Students will explore the role of cultural awareness in honoring the Universal Declaration of Human Rights for every person. In partners, have students answer the following questions and then follow with a class discussion. 1. Why is understanding our own culture important when studying the history of Canada? 2. List as many cross cultural interactions in Canadian history as you can think of. 3. What are some current realities that are tied to historical cultural interactions where one culture did not respect the ways of the other culture? Individually, have students reflect of how human rights have been violated in Canadian history because of cultural differences. 1. Through each essential question, refer back to the role of cross cultural interactions for each time period. 2. For each cluster, highlight human rights offenses that happened and talk about how those rights violations effect people in Canada today. 3. After studying each cluster, have students create culture cards that outline the characteristics of each group involved before they came into contact with others. Then have students interact based on those cultural cards and discuss emotions, perceptions and actions that they experienced in the game. Tie those into the history studied. 4. Talk about globalization and its effect on our understanding of ourselves and others. How will our understanding of culture, our history and the world influence what happens in our country now? THE WAY THINGS ARE DONE For each of the topics/ events, think about how it is done in your house and answer the questions. Be prepared to discuss with a group and share as many detailed responses as possible. Meals: Who makes meals? When do you eat them? Do you eat alone or together? How do you know when to start eating? What happens if you don’t like the food? What does a typical meal include? Who cleans up the meal? When do you clean up the meal? Are there any household rules regarding meals? Other: Chores Do you have to do chores? What if you don’t do them? How many hours do you do chores a week? Do you get paid for chores? Do your parents do chores? Other: Authority What do you have to ask permission for? Who do you ask permission from? What rules do you have to follow? What happens when you don’t follow those rules? Verbal and Non Verbal Communication How do you show agreement? How do you show disagreement? How do you show affection? How do you greet a visitor? How do you greet a family member? How do you show respect to someone? Get into groups of four and discuss each question. How many differences can you find? How many similarities? Feel free to discuss items not on the list, but related to your culture. Synopsis: Students will be broken up into two groups and given the details of their group. They will then have to interact with each other and try to socially maneuver through miscommunications. There are two rounds of this game with groups taking turns being the visiting and the visited cultural group. This is a group of anthropologists trying to pick up the thread where their earlier colleagues’ research left off. They have received funding from the government to visit and learn as much as they can about them. As their funding is limited, they have to meet their deadline. Very easy- going, peaceable culture Rules: 1) speakers stand shoulder to shoulder, facing opposite directions, not face to face when conversing 2) It is rude to talk too fast or respond to someone without waiting at least five seconds. There must be a five second wait between question and response and vice versa. Both of these rules must be observed by both groups. 3) Women hold their hands in front of them and men hold theirs behind them. When an outsider does not adhere to rule 1 or 2, members of this culture just walk away without explanation, thus ending conversation. Visiting a new country and very interested in learning more about it by talking to some of the inhabitants. When they enter the room, they are to try to start conversations to learn about their culture. Pacific Islanders who have a wonderful, peaceful culture that has been spared the ravages of invasion, colonization and cultural intrusions. Many years ago, they were visited by anthropologists, but the visit was a disaster and no outsiders had visited since then. Rules: 1) Within the group, anyone can talk to anyone but when talking to people not of their culture, men can only talk to men and women only to women. 2) Islanders do not initiate conversation, but can respond to yes or no questions. The answer given is based on the facial expression of the person asking the question- if they are wearing a smile, the answer will be ‘yes’ (regardless of the true answer) and if they are not smiling, the answer will be ‘no’ If a visitor breaks a rule, they walk away without explanation. Playing the Game 1) Divide the students into two groups. This would be best played in a larger space. 2) Have one group go out of hearing range and explain the rules to each group separately. 3) Allow time for the ‘visited’ group to practice their rules. It may be difficult for groups to wait the full five seconds between question and responses. 4) Bring groups together and allow them to interact for 5 to 10 minutes. 5) Interrupt and do a partial debriefing of the visiting group in front of the other group. What are the impressions and what have they figured out? How would they describe this group? Do not give away any rules yet! 6) Give students another 5 to 10 minutes. 7) Debrief as a class, each group taking a turn, briefly addressing any or all of these questions. a. What did you feel during interactions? b. Did you feel respected at the beginning of the time together? Did that change by the end? c. What assumptions did you make about the other group? Did those help communicate? d. Did you like how you acted in the interactions? 8) For Round 2, follow the same steps except that at the end do a more in depth debriefing. Game adapted from "Rotary Youth Exchange Documents." Rotary Youth Exchange Officer Resource Web Site. Web. 17 Dec. 2010. .
Bafa Bafa It is available at the Manitoba Education Instructional Resources Library Unit (1181 Portage Ave., Winnipeg, MB) with the following cataloguing information. Title: BaFa, BaFa: a cross culture simulation / By R. Garry Shirts. [game] Description: 2 sound cassettes, 30 tibber cards, 30 stipper cards, 30 blimmer cards, 4 alpha badges, 4 beta badges, 312 alpha cards, 101 player's pieces, 2 director's guides, + 373 multi-coloured beta trading cards ; in container,29 X 23 X 3 cm. Notes: Gives participants experience in observing and interacting with a different culture. Gr. 7-9, 10-12, adult. "Culture | Define Culture at Dictionary.com." Dictionary.com | Find the Meanings and Definitions of Words at Dictionary.com. Web. 17 Dec. 2010. .
Report "CROSS CULTURAL INTERACTIONS & HUMAN RIGHTS"